Discussion in 'Old StrongFirst Forum (Read-Only)' started by xagunos, Dec 27, 2013. I’m planning to start the 40 day program using the “best exercises”. Should I add an anterior chain (ab) exercise and if so what? I think Zercher and pullups especially if you are doing them in hollow position will work your abs very hard. I rarely train directly abs, but if you want some - sure, you can. I think Hardstyle ABS program will fit here perfectly. Do 2 weeks hardstyle situps, 2 weeks HLR progressions or just do some evil wheels if you have it. Toss in a couple get ups and/or carries and you're golden. It is true that Dan likes to toss an anti-flexion (I think that's how he says it)/abs drill at the end. The first time I did the 40 Day program I did ab walkouts, and the second time I did weighted carries. Not sure if the latter really counted as an ab exercise, but I enjoyed ending the workout with those. Plus I think they helped me a lot. I'd say pick whatever ab related exercise sounds interesting to you and give it a go. As Dan says, it's only 40 days. You can learn a lot in that time but it's not so long you get burned out. I'd also like to see a write up of your results after you are done. It's always interesting to see what people get out of this kind of daily, or near daily, practice. I agree with the first poster, zerchers and heavy pull-ups do good. Let's hope your at least 225+ for zercher for it to matter though. I would add rotational work if I added any, but you could test ab strength now and after, and do no ab work. See what happens. 10-15x3 sets/reps heavy zerchers on the minute make my abs cramp bad. IMO that's plenty cos of the selection of exercises. When I did 40 days, I used HLR. You can also always "relax" with l-sit hang from pullup bar at the end of your training. I wouldn't say it's necessary to add an abdominal movement to the list, but you probably could adapt to it after a few training sessions. It would also depend somewhat on your pullup numbers: how much weight do you plan to add? I've come to the conclusion that ab won't be too necessary. I did a sample workout yesterday with fairly heavy weights and my abs were quite sore from the pullups. So, I think I need to write an article about this again. The original 40 Day program was my prep for 2004 and the discus year from a conversation with Pavel. In hindsight, I would have done many things different, but, really, the template was outstanding. I still laugh at how complex people make it as I just some simple stuff. Frequent, low rep, high-quality strength work + Less frequent, high-intensity metabolic conditioning + As much joint mobility and low-intensity cardiovascular activity as possible. Strength train 5 days a week, frequently, low-rep, constant load. Here’s what I mean: pick a couple of lifts—actually, use my friend Dan John’s fundamental human movement blueprint: push, pull, hinge, squat, loaded carry. Work each lift, each day, and in the manner of 1,2,3,1,2,3 (ladder format). Because the frequency is high, the volume is low, and so is the density, too. The intensity, in my book, should not be waved—meaning, start your cycle with a “heavy” load, say, your 5 rep max, work that for three months, in the manner just mentioned, or until it starts to feel “light.” Then, reassess, bump the weight up to what is hopefully your new 5 rep max, and repeat the operation. In effect, the load has been waved by not waving it at all—no calculating percentages, none of that hooey. You just get strong instead, which, to me, is far more appealing than having to deal with the inconvenience of math. This is strength training in the extremest simplicity. Two to three days a week, perhaps a bit less or a bit more, depending upon your sport, recovery, and other such etceteras, add in some high-intensity metabolic work. 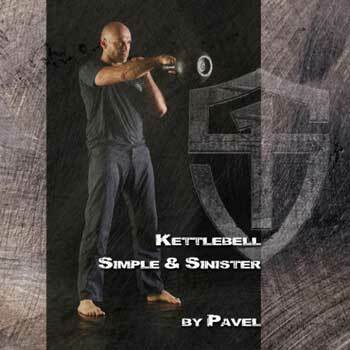 I like sprints and kettlebell complexes, because they are simple, and metabolics should be simple." Note that in the 90 Day Program, he adds Power A and Power B...a concept I like a lot. I just have simply added Vertical Jumps with a target, but keep it simple. Note, too, that in his 90 approach you don't do every movement every day...you certainly touch on everything, though...but you slide through them as you march through the weeks. The reason I always add either an ab wheel or Hanging Leg Raise or L Sit Hold to this should be obvious: if you are doing deadlifts as you core hinge...maybe swings or swings in the warm up...you might (might!) need something to go the other way. I called it "anterior chain" once as kind of a joke, but it stuck and I think it makes a lot of sense a decade later still. So, If you are doing a 40 day template, rule one is this: do the 40 days. Right or wrong, finish it, then, come back and make it better. I do 21, 40 and 90 day workouts all the time. I just get into them and follow it along and don't judge it. Then, after you finish, ask those big questions about too much or too little. Dan, wow that is a fantastic way to program. Thank you for posting that, and thanks to Pat for coming up with it. Definitely something I'd like to experiment with some time. I'm assuming with swings you would make a modification like ladders of 10-15-25, and something like 3-5 get ups per side? Thanks everyone for the feedback, I have one more question on Zercher Squats. What technique is preferred, the ATG front squat style or the deadlift/good morning style where the bar just touches your thighs? I have nothing to add on Zerchers. That really boils E/ES down even further. I've been following S&S since late Nov just using the 24kg bell and refining the two movements. I wanted to maintain my pressing & pulling so I've been doing a couple of ladders (1,2,3) of handstand push-up's & chins a few sessions per week opposite of S&S. I walk or jog on most days and do hill sprints about once per week. I've been feeling wonderful and have had no problems handling my holiday jobs; wrestling kids, carrying loads of firewood, Xmas trees, etc. It is basically a stripped down EES. Luckily it's only taken me 30 years to figure it out. Thanks again for all of your writing. Dan, the blog post of yours is excellent! is really easy to do is done very quickly. I love intelligent conversation on this kind of workout.